Wednesday's U.S. debut follows a December 2015 BBC-TV rollout. It started with the 2003 book Roy Orbison: Invention of an Alternative Rock Masculinity. 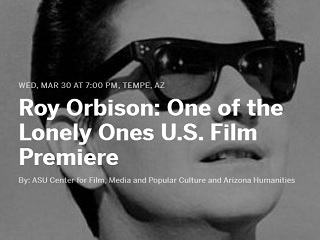 Post-publication, author Peter Lehman was contacted by British documentary filmmaker Jeremy Marre, who eventually used the book as a guide for his December 2015 BBC-TV documentary Roy Orbison: One of the Lonely Ones. Lehman was impressed with Marre’s vision and knowledge of material; the filmmaker had also directed documentaries on such famous musicians as Marvin Gaye, James Brown and Otis Redding. “The conversation showed me Jeremy was taking the subject matter very seriously in not repeating the same cliches that are often associated with music documentaries,” said Lehman, who is also a professor of film and media studies in the Department of English. Similarly, the March 30 premiere is an offshoot of a trip by Marre to the U.S. planned primarily for other reasons. In the ASU Now piece, there’s lots more info about Orbison’s career as well as the added bonus of some song analysis by the school’s senior music lecturer Mike Shellans (also embedded below).